The specially treated acrylic in the middle provides a homogenous lighting. Double Sided Smart LED Boxes are 27.5mm in thickness with 25mm Snap Profiles for easy poster changing and offers a built in on/off switch. 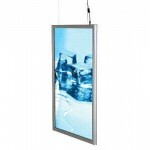 Our LED light panels are an ideal choice for suspending from ceilings. Double Sided Smart LED Light Box A1.. Double Sided Smart LED Light Box A2.. Double Sided Smart LED Light Box A3.. Double Sided Smart LED Light Box A4..